Dr. Baus and Brooke Pape of Wisconsin Equine present the award to Rebecca Kozma and trainers Kim Gardiner and Mara Kranz-Olseng. 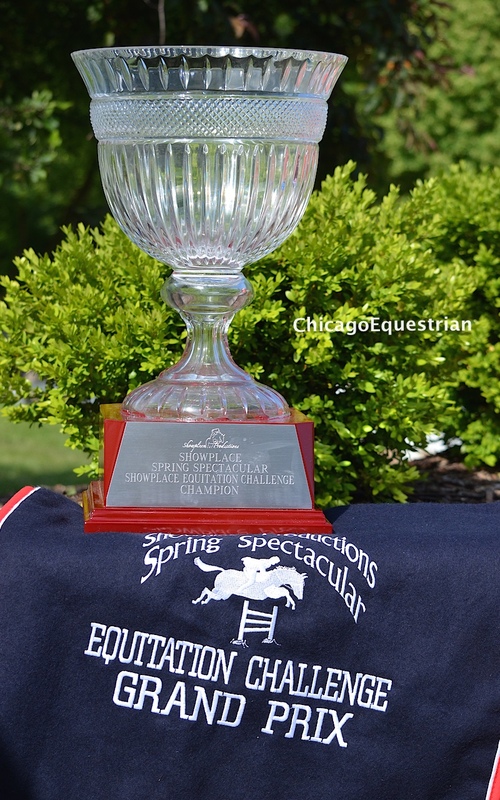 Wayne, IL – June 21, 2015 – The final day of Showplace Productions’ Spring Spectacular III brought the highly anticipated Showplace Equitation Challenge sponsored by Wisconsin Equine Clinic. Showplace Productions began the class in 2014 to provide an opportunity for equitation riders to practice for other large equitation championship classes in other parts of the country. The class is similar to the George H. Morris Equitation Championship, which is held at the Winter Equestrian Festival in Wellington, FL. Show manager Pat Boyle, is known for his innovative classes and often serves as a test pilot for future classes and special events. Invitations were extended to the top placing riders of the USEF Pessoa Medal, the ASPCA Maclay, the USET Talent Search and the WIHS Hunter and Jumper phases during the three-week Spring Spectacular Series. Thirteen riders took on the challenge of the unique class. Riders perform every phase of the class without the assistance of a trainer, including the course walk and schooling. Competitors complete the first round and the top 12 return for the second round, again without the assistance of a trainer. The judges then call back a minimum of four riders for additional testing. The schooling judge also gives a score based on the rider’s ability to prepare their horse while following the USEF schooling rules. Giavanna Rinaldi took the early lead. Giavanna Rinaldi of Wayne, IL, put in a strong first round to take the lead with a score of 86 plus two points from the schooling judge. Rebecca Kozma from Streamwood, IL, followed with an 82 plus two from the warm up area. Louisa Brackett, Grayslake, IL, earned an 80 plus one point for schooling with Sloan Hopson of Houston, TX earning a 78 but no extra schooling points. 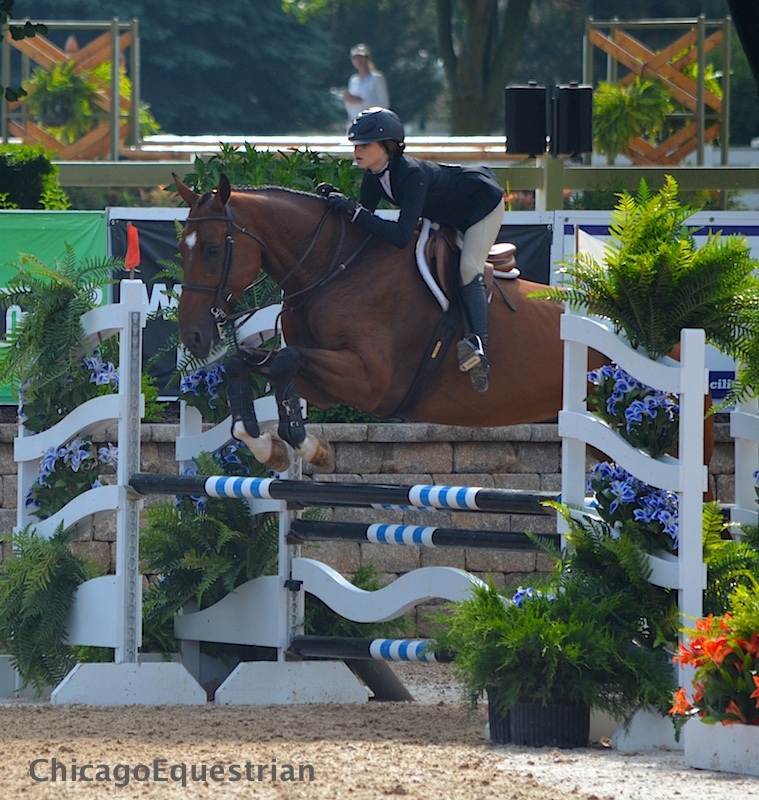 Rounding out the top five was Allie Donaldson of Deerpark, IL, with a 74 plus two from the schooling judge. The top twelve competitors were then allowed to walk the course for round two and mounted up to take a swing at the championship title. 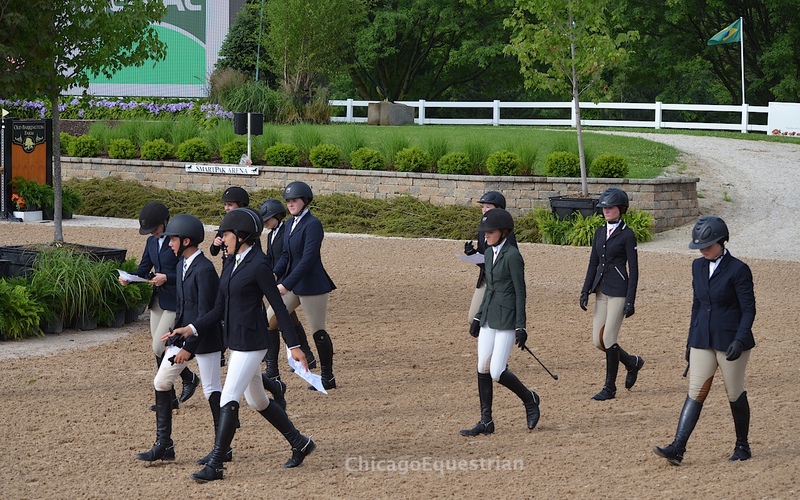 Riders walk the course for the second round of competition. Rinaldi again put in a great round to earn an 87 to go with her first round score of 88 for a 175 total, keeping her in the lead after round two. Kozma earned a solid 86 to better her first round score of 84 holding her second place spot with a 170. Hopsonmoved up to capture the third place spot with her original 78 for a 156 for third. Brackett wasn’t as smooth this round and scored a 67 for a total of 148 for the fourth place spot. Donaldson again stayed in the hunt with a second round score of 71 and a total of 147 for fifth. Rebecca Kozma and Finn fought to the finish for the win. Judges then called these top five riders into the corner of the ring to hear their final test. The exhibitors had to counter canter to jump one, canter jump two, demonstrate two simple changes of lead, canter 3A and 3B, trot fence four and hand gallop the last jump. Sloan Hopson rode Ventura to the third place spot. Some riders had difficulty executing the simple lead changes in time to get enough pace to jump the in and out, causing a two stride mistake in the one stride. Rinaldihad an unfortunate rail at the last jump and a slight glitch picking up the counter canter. Kozma got to a very deep distance at the hand gallop jump but executed the simple changes well, jumping the second jump a bit left to right to give herself more room. It was a close call to the end but it was Kozma who came out on top after the dust settled. Kozma competed in the class last year and placed second behind accomplished rider, Caitlin Boyle. Kozma has been knocking at the door for a big win and came off of a strong few weeks, earning the 15-17 Equitation Championship weeks I and III and earned the prestigious Monica Fowler Memorial Equitation Trophy. Kozma is already qualified for the ASPCA Maclay Regionals and the USEF Pessoa Medal finals thanks to her mount of two years now, Finn, a seven-year-old gelding. Kozma plans to compete in the Medal finals at the Pennsylvania National Horse Show and the ASPCA Maclay regionals in Kentucky this fall. 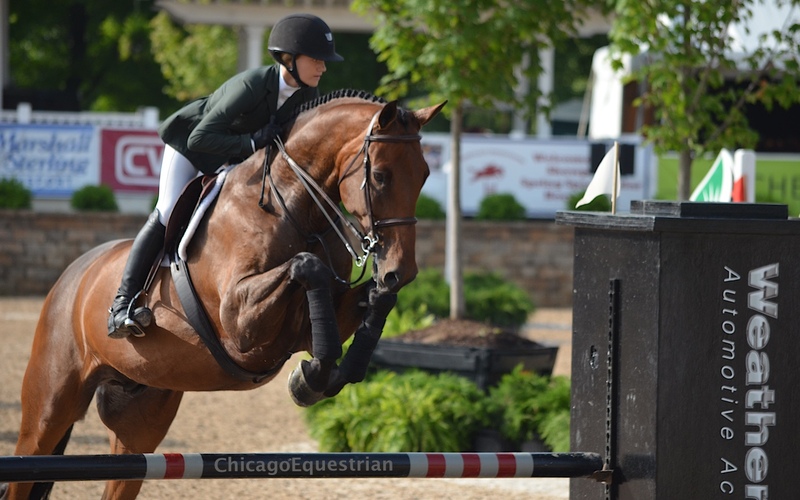 Rinaldi also had a successful three-week series riding her way to the Overall High Point Junior Hunter Rider Perpetual Trophy. Rinaldi qualified for the medal and Maclay during the Winter Equestrian Festival on her mount, Cayambe, so she hasn’t been doing a lot of equitation lately. Her mount is an eight-year-old horse and not as seasoned as some of the other equitation horses. Rinaldi will gear up for the equitation closer to the Maclay regionals, which are held in Kentucky this fall. The trainers of the top riders in the class receive a cash bonus. Trainers Kim Gardiner and Mara Kranz-Olseng of Perfecta Farm will receive the top bonus of $1,000 as Kozma’s trainers and Haylie Jayne-Rolf of Our Day Farm earned $750 as Rinaldi’s trainer. 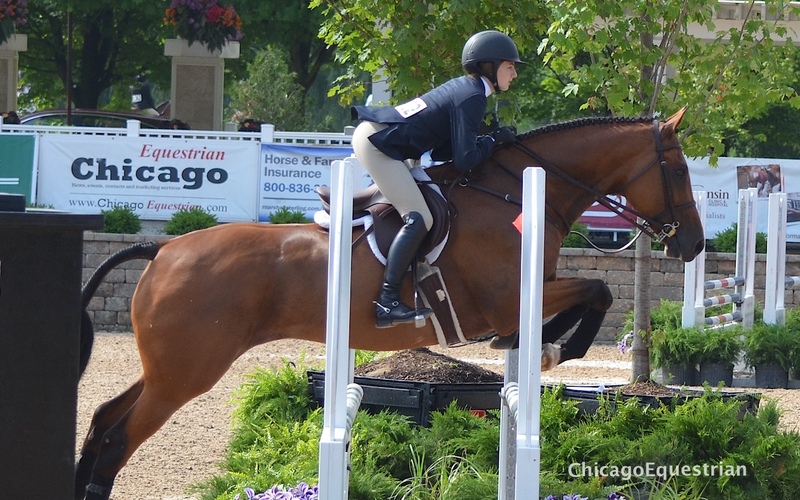 These riders will have a chance to compete again in September at the Showplace Fall Classic and Illinois Hunter Jumper Association’s Medal Finals.